Yesterday I was told that it is 6 weeks to Christmas, So I thought I had better get my act into gear with making Christmas cards and presents. On my desk are a couple of Christmas paper pads and stamps which I have been using for inspiration to make some cards. I love all the bright reds and greens in the paper pads, really happy colours. Also I have been using my Clearly Besotted stamps and the stamps and dies from Sizzix that I won recently. I have really got to get prepared for Christmas as I have roughly 9 weeks left in my pregnancy and have no idea how long I will be able to create before the baby arrives as I am getting really uncomfortable already. So I had better get off and make some more cards. Enjoy having a look at the other desks. 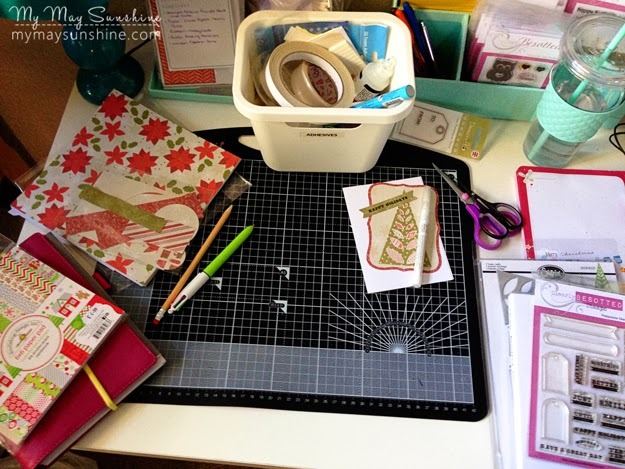 Linking up with Julia @ Stamping Ground.